In Doom and Cookies you play orphans determined to escape from the evil orphanage owner, Mr. Keeton and his foul Wife. The system has a story game feel to it: players set the scene and put their characters into peril (Doom) and that's where the cookies come in. You work together to confront the Doom of your own invention and the Doom confronting the whole orphanage. 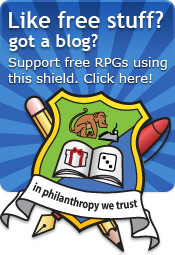 Doom and Cookies is novel, tight and a worthy entry into the 1KM1KT / RPG Blog 24 hour RPG competition. Character creation is a speedy affair. You begin by picking a name. You're playing a child, so names like Tom and Susan are preferable over GORGOTH THE DESTROYER. Then choose a talent, an adjective that describes the core of your character. There is a list of examples for you to choose from or pick your own. A skill is next (yes, just one) and this is what you're best at. That's it! You are urged to add some more depth but it's not required. Doom and Cookies doesn't have a setting. It has a feel, a creepy, unsettling Tim Burton aroma. It's aimed at a time between Victorian and Edwardian England (echoing the author's heritage) but you can transpose that to your own locale. The orphanage is dark and dangerous, riddled with the perils of emerging technologies of gas and elastic trickery in the home. 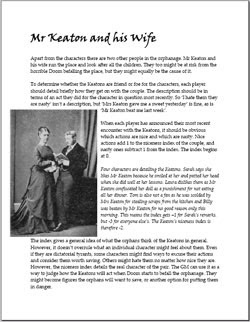 Mr. Keeton and his foul wife are suitably evil and would bring out a Boo and a Hiss in even the most cynical mind. 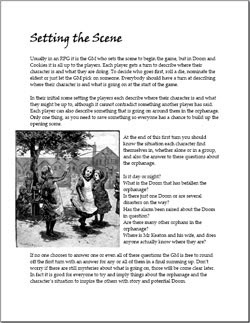 The players set the scene, taking it in turn to pile on description and back story. Each player can choose put their character in some jeopardy, at which point the takes a cookie from a bowl in the middle of the table. An example of Doom is 'The character is temporarily blinded by a bright light'. You also set a Doom that affects the orphanage as a whole. Resolving actions is more about dealing with Doom. TO do this, roll a d6. A 6 is success, 5 means that you might have dealt with that Doom but you have to assign yourself another without taking a cookie. You get +1 for each talent or skill that applies. You also get +1 if you spend (eat) one of the cookies you've collected. Nice. Dangerous tasks give you an injury, for which there is a table. Opposed rolls are made by D6 + talents + skills and cookies. Can you improve a cookie? [24 Hour Proviso] I would like to see a contents page, page numbers, contact information, smaller font, two columns, a sample adventure, index and a character sheet. The language used to describe skills and traits could feel a little more Edwardian or child-like. For example 'Scallywag' rather than 'Crime'. One difficulty I think Doom and Cookies is that it relies very much on the descriptive power of the players. This is a facet of most story games but it is normally mitigated with plenty of descriptive flavour. Doom and Cookies' brevity eschews that, burdening the players even further. 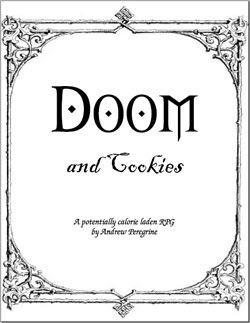 Doom and Cookies is ideal for a long one-shot session. It has a light and lilting sense of humour reminiscent of Douglas Adams. The layout is clear, the pictures exceptionally well chosen. What is striking about Doom and Cookies is that it delivers precisely what it sets out to do. Setting and mechanic interlocks such that it could be a manifesto against generic systems. Many thanks to Andrew for sharing a real eye opener! Hi Rob. Just an anonymous fan of your blog, hoping you are doing well and working on a new post. Keep up the great work.